hunt for a new dressing recipe. This recipe comes from Valerie Bertinelli. She has a fab Saturday morning cooking show on the Food Network where she was promoting her dressing recipe on a Thanksgiving episode. I changed up the recipe slightly. First, I bought two packages of pre-made cornbread from the Albertson’s bakery. 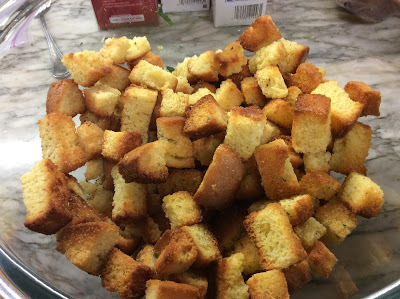 I cut the cornbread into cubes and spread them out onto a cookie sheet into a preheated 350 degree oven to crisp up (kind of like croutons). I tossed them every 5 minutes and toasted them in the oven for about 25 minutes. I let them set on the counter to cool while I prepared all the ingredients. The recipe calls for toasted walnuts which I chose to leave out. I am not a “nut in my food” girl, so while I am sure including nuts offers a toasty crunch, I chose to omit them. 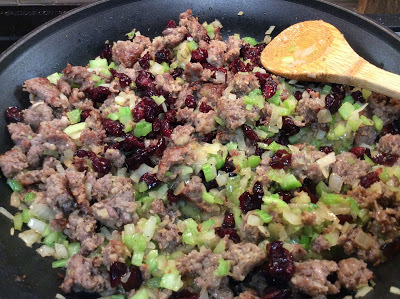 This is the sausage, onion, celery, cranberries and the seasonings cooking on the stove. You mix this in with the cornbread, chicken broth and a beaten egg. I put it into the refrigerator and I will bake it tomorrow. 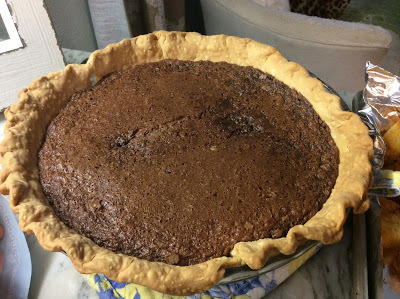 Next, I made a Chocolate Chess Pie. I mean, the Pilgrims were all set on Pecan and Pumpkin pies, but I like chocolate. Warning: Look away if you are hard-core with homemade crust. 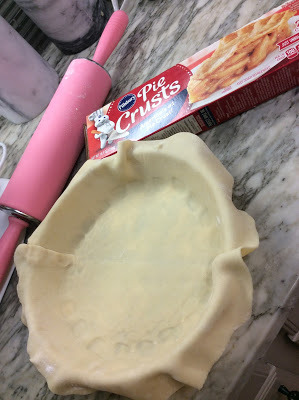 I am about to show you pre-made pie crust. 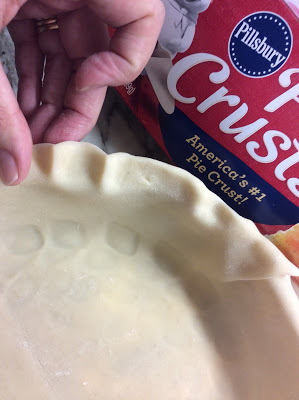 Pillsbury has perfected a recipe for pie crust that tastes just as good as homemade especially if the thought of making crust stresses you out. It comes with two crusts in a box. 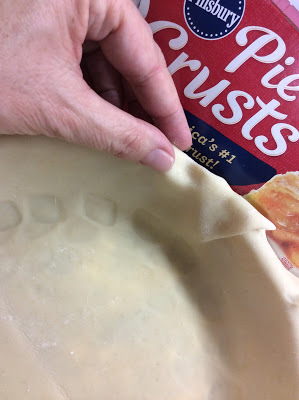 If you’re a beginner with the pie crust thing, here’s my attempt to show you how easy it is to use. I forgot to snap a pic of me rolling the crust out. I placed two pieces of waxed paper on the counter, sprinkled with flour. 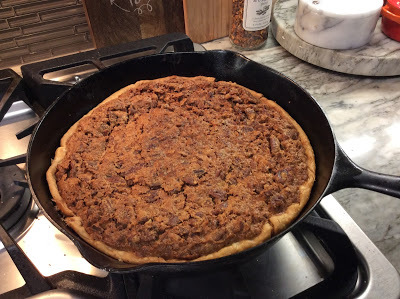 Then take your rolling pin and roll out the crust slightly bigger than your pie plate so you have dough that hangs over the sides. 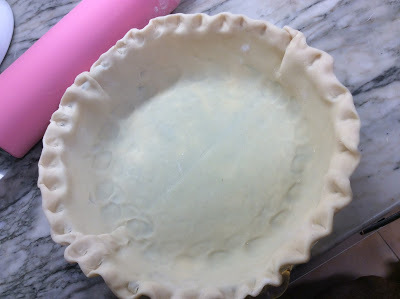 If you don’t roll your crust out a bit, it will be too small for your pie plate and you won’t get the effect of a crimped crust along the edge. Press the dough down into the plate on the bottom and along the sides. 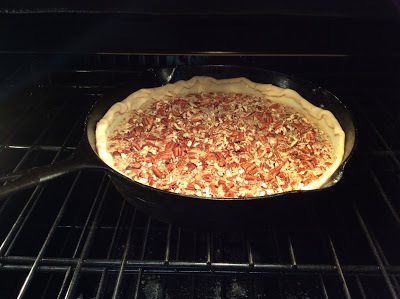 Fold the dough under all the way around the rim of the pie plate. 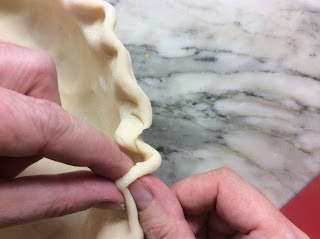 Then crimp the edges using your thumb and index finger. 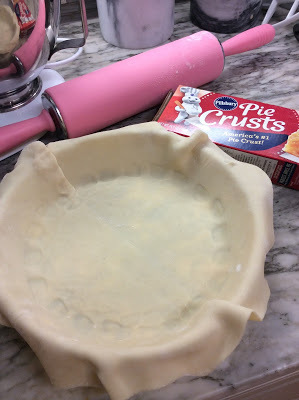 Here’s your finished pie crust. And here it is after its three hour tour of my oven. Later this evening I am making a macaroni and cheese and in the morning the last thing will be mashed potatoes and a corn casserole. My sister-in-law is bringing Earnie’s Sweet Potato Delight and green bean casserole. And, we have Jane’s cranberry sauce, too. I have no idea how six people will eat all of this food along with a 13-pound turkey but Miss Bee requested it. I have to-go containers ready to send leftovers home with guests. As we speak she is pressuring me to make a pumpkin pie, even though we have a sweet potato pie with marshmallow meringue all ready to go from Lucy’s Sweet Pies (I’ll show you a picture of it later).